Many go down the route of least resistance and opt for a do-it-all entertainment on demand set-top box, such as Sky+ or BT Vision, paying a monthly subscription so they never have to get their hands the slightest bit dirty with an extra cable or two. Nothing, however, has yet displaced building your own media centre to sit at the side of your TV as the ultimate symbol of home hackery. Since the days when phrases like 'digital home' still sounded far reaching, we've been inundated with devices that are supposed to make media streaming easier, but they all add either an extra layer of complexity or force you to relinquish some important level of control. In the case of a set-top streamer, for example, you still need a separate server, running up your electricity bill and presenting a low to medium fire hazard, somewhere in the house or garden. Set-top PVRs such as Virgin's V-Box are great, but they are limited for storage space and there's not a lot you can do with recordings once they're made. No, the only truly efficient, flexible way to get the right setup is to put together a tiny PC to sit by your TV and make it the centre piece of a hi-def audio and video set-up that puts you in complete control of what you watch and listen to. Just don't be surprised if friends call you a geek, because you have to wait for it to boot before they can watch the footie. So you've decided to build a media centre? Where do you start? It's fairly obvious that your first decision is going to be the case. 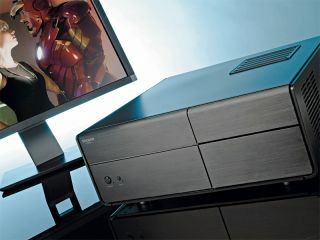 There are few lounges that have room for a PC tower, even a diminutive mid-rise one, and any large chassis that runs quietly enough is going to be huge. At the other end of the scale, small-form factor Mini-ITX cases aren't just for low-power Via CPUs any more, you can squash a top-end system into one if you try. Gigabyte even has a board based on Intel's H55 chipset for Core i3/i5/i7 processors that includes USB 3.0 support. Barely the size of a Nintendo Wii, it gives you the potential for putting a supercomputer in a matchbox. Unfortunately, you'll still need a full-size ATX power supply for the desktop chip, and there's not a lot of room inside a Mini-ITX for a graphics card and internal TV tuners. For the heat issues alone, we're going to avoid them. Instead, we're sticking with a full-size ATX case, but one of the many that have been designed for living room use (in this instance by Zalman). That means it looks good and some thought has been given to keeping it quiet too – although we're going to improve its acoustics by replacing the two small case fans with a 12cm one. The Zalman case means is that we have plenty of room for extra storage, a twin-tuner TV card and a discrete graphics processor to speed up video encoding. Even with the quad core Intel i5 750 CPU that we've chosen as our processor, it can take a long time to rip a DVD to file using Handbrake. If you're looking to save money, a dual-core i3 CPU and integrated graphics will still outperform many media centres of yesteryear and is more than capable of pausing live TV and recording two streams at once. In our extravagance, we've added a small SSD drive to act as our system disk. That should help our media centre boot up or restore from hibernate quickly, and keeping a separate drive for our recordings makes it easy to swap in or add extra capacity later on. There's a terabyte and a half in there to start, mounted in a silent hard drive from Quiet PC. An alternative option would be to forgo a large internal drive altogether and dump all your audio and video files onto a NAS box for easy streaming anywhere. You'll still need some space for working with video files locally, just not as much. Inside the media machine, you'll also need an optical drive. We've gone for a combined DVD and Blu-ray burner, which means HD movies and lots of back-up space. It's a corner you can cut by just going for a regular DVD-RW if you like. The final internal component worth noting is the power supply. In the last few PC builds I've put together, the power supply has consistently been the noisiest component, while at the same time being the one you can't do anything to shut up (I'm not brave enough to go prodding around the capacitors inside a 700 to 1,000W PSU). Silent PSUs, on the other hand, are notoriously unreliable. There's no way you can run a large transformer without generating heat – so we've opted for an intelligently cooled Zalman model, which should provide enough juice for the other components without drowning them out. Outside of the case, Logitech is the undisputed master of living room peripherals with its awesome, yet relatively inexpensive, Z5500 surround sound system and the excellent Dinovo Mini keyboard controller. The obvious temptation is to go for a traditional looking remote control, rather than this tiny Bluetooth keyboard with built-in mouse pad, but the thinking here is that if you plan to use your media centre to do anything other than watch TV – such as surf the web or read an email – then a remote won't be enough. The Dinovo Mini is a gorgeous compromise that does keyboard, mouse and remote in one and folds up to a discrete compact style when not in use. Again, though, it is pricey so if you want to shave £50 or so off of our build price any wireless keyboard and mouse will do. As far as software goes, the main choice concerns what operating system to use. Windows 7 is excellent for a media centre box, not just because it has good driver support and a TV-style menu screen built-in, but because it's just about the only OS that has effective DPI scaling. Having a 'ten foot interface' so that the main media menu is usable from the couch is one thing, but in Windows' Display control panel you can compensate for the lack of pixels on a large TV screen by scaling the desktop rendering up so that web pages and dialogue boxes are visible too. Bill of materials: Cash or card, sir?